A galaxy called Segue 1 appears to be heavily dominated by dark matter. Astronomers have discovered a galaxy harboring more dark matter than any seen before. The galaxy is a small group of about 1,000 small, dim stars just outside the Milky Way called Segue 1. But while most of those stars appear to have roughly the mass of the sun, the galaxy as a whole weighs 600,000 times the mass of the sun. That means the normal matter stars are vastly outweighed by dark matter. Invisible dark matter has never been directly detected, but scientists think it exists based on the gravitational pull it exerts on the rest of the universe. To parse how much regular matter and dark matter are in the galaxy, the researchers studied the motions of the visible light stars. If the 1,000 or so stars were all there was to Segue 1, with just a smidgeon of dark matter, the stars should all move at about the same speed. But the Keck data show they do not. Instead of moving at a steady 130 miles per second (209 kilometers per second) relative to the Milky Way, some of the Segue 1 stars are moving at rates as slow as 121 miles per second (194 kilometers per second) while others are going as fast as 139 miles per second (224 kilometers per second). "That tells you Segue 1 must have much more mass to accelerate the stars to those velocities," Yale University astronomer Marla Geha said in a statement. Geha, along with Joshua Simon from the Carnegie Institution of Washington, and their colleagues first reported hints of the galaxy's dark matter content in 2008, but the new study provides stronger evidence. 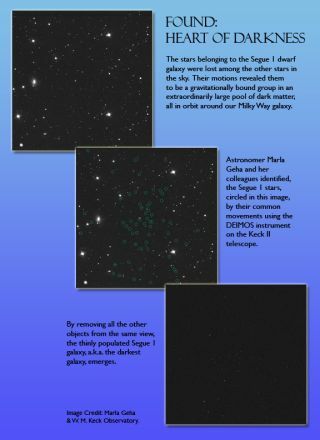 The researchers detailed their new findings in the May 2011 issue of The Astrophysical Journal. Segue 1 is not just interesting because of its dark nature, but because it represents an unusual collection of nearly primordial stars, the researchers said. One way to tell how long ago a star formed is by its heavy element content, which can be gleaned by looking at the specific wavelengths of light emitted by a star. Very old or primitive stars come from a time when the universe was young and few large stars had yet grown old enough to fuse lightweight atoms like hydrogen and helium into heavier elements like iron and oxygen. Early, and therefore ancient, stars that formed from early gas clouds are therefore very low in heavy elements. The researchers managed to gather iron data on six stars in Segue 1 with the Keck II telescope, and a seventh Segue 1 star was measured by an Australian team using the Very Large Telescope in Chile. Of those seven, three proved to have less than one 2,500th as much iron as our own sun. "That suggests these are some of the oldest and least evolved stars that are known," Simon said. Searches for such primitive stars among the Milky Way's billions have yielded less than 30. "In Segue 1 we already have 10 percent of the total in the Milky Way," Geha said. "For studying these most primitive stars, dwarf galaxies are going to be very important." The researchers hope Segue 1 will be able to shed more light on the mysterious nature of dark matter. Some researchers have been looking with the space-based Fermi Gamma Ray Telescope in hopes of catching sight of a faint glimmer of high-energy light called gamma rays, which could be created by the collision and annihilation of pairs of dark matter particles, scientists theorize. But so far that search has turned up nothing. However, that doesn't mean the dark matter isn't there, said Simon. "The current predictions are that the Fermi telescope is just barely strong enough or perhaps not quite strong enough to see these gamma rays from Segue 1," Simon explained. So there are hopes that Fermi will detect at least the hint of a collision. "A detection would be spectacular. People have been trying to learn about dark matter for 35 years and not made much progress. Even a faint glow of the predicted gamma rays would be a powerful confirmation of theoretical predictions about the nature of dark matter." In the meantime, astronomers suspect there are other, perhaps even darker dwarf galaxies hovering around the Milky Way, waiting to be discovered. "We'd like to find more objects like Segue 1," Simon said.